Artificial putting greens are becoming increasingly popular and not just at golf clubs and practice centres. Many homeowners who are keen golfers are now installing their own small putting areas in their gardens and the hotel and corporate entertainment sectors are also busy with this type of installation. Synthetic turf has been used for many years in golf, for tees, putting greens, ranges and fairways. Due to the specific demands required for golf, Pride Artificial Grass believe in supplying an individual product for an individual customer. Today’s high quality, professionally installed synthetic turf golf green should last in excess of 20 years. Whether you are a golf club wanting to set up synthetic turf putting greens or even if you only want to create a mini golf area in your back garden, please contact us – we can help. 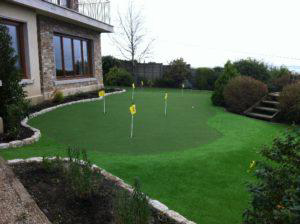 Our artificial grass putting greens are the ideal way to practice and enjoy golf at home, work or for a leisure area. We offer a full custom service to make a putting green for your specific space. 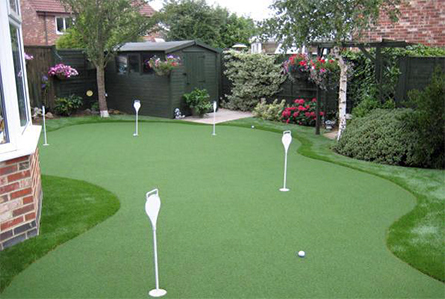 PRIDE ARTIFICIAL GRASS can provide bespoke artificial putting greens (as per photos) – please email us a rough sketch. You can choose from two types of artificial grass designed especially to be used for putting greens: NylonPRO and NovaGreen. The greens can also be fringed with artificial grass, letting you practice chipping onto the putting area. You can choose from two types of artificial grass designed especially to be used for putting greens: NovaPRO and NovaGreen. The greens can also be fringed with artificial grass, letting you practice chipping onto the putting area. To start planning your artificial putting green, request a sample today. Or, for larger commercial products, contact our golf specialists on 01-2011289. Pride Artificial Grass can give more specific advice or arrange a visit to your premises. We offer a countrywide professional installation service. Option to increase stimp speed by adding kiln dry sand. Your artificial putting green can also be enhanced with a grass fringe, allowing you to practice chipping and pitching onto the green. Our range of fringe grass is available from 26mm to 40mm.